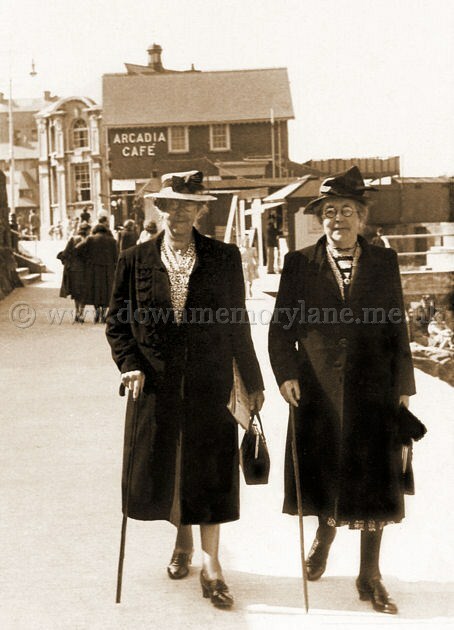 It's summertime and here we are on the strand at Portrush in the 1940's. Looking for a place to sit and spread out the blanket and have a good read is Martha Rea nee Crawford. photographers stood for to get to the strand and the beach you had to pass this way. Going to get a place to sit, and relax and enjoy the newspaper she has brought with her is Martha Rea nee Crawford. 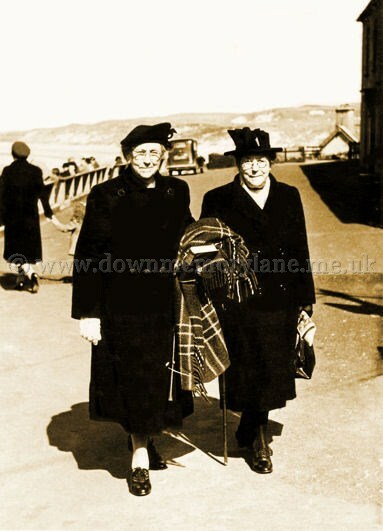 Along side Martha is her mother Sarah Ann Crawford enjoying the fresh sea air which was rare in Creavery. Here we are in Portrush, on the other side is the road that takes you down to the harbour. Now having found this spot William Clarke, Lavenia McIlvenna and finally William's wife Sarah who had all come from Randalstown for a day out. At Sarah's side is why we all love our mums, it's the bag full of sandwiches and lemonade and boy do they taste so good. 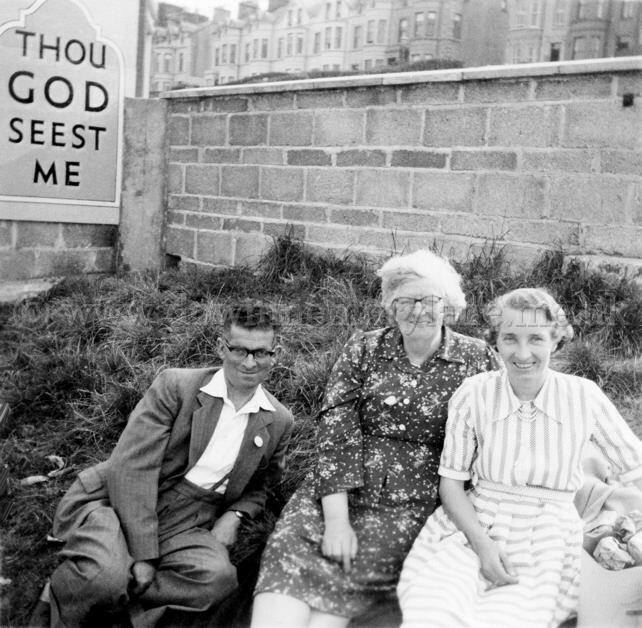 Behind them is a great sign which does not need any explanation. Looking up the driveway to the Causeway Hotel you can tell not only by the clothing on the people but that no motor cars had been here only horse drawn vehicles because of the tracks so the photograph must have been taken early 1900's. 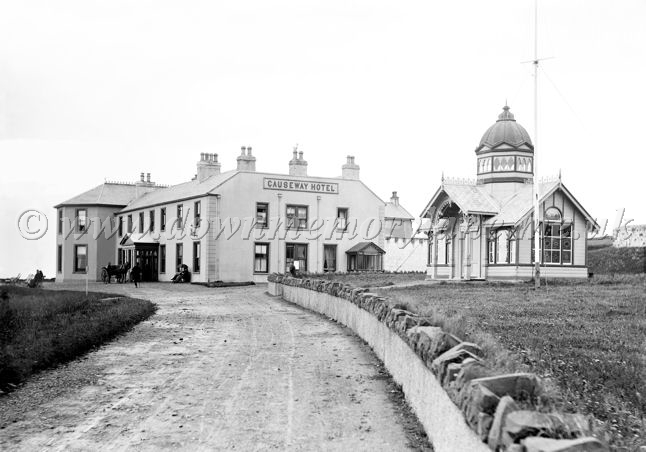 On the right of the photograph is a Refreshments room, now onto the side of the Causeway Hotel and the entrance there is to another Refreshments room serving tea, coffee, sandwiches and cakes, looking towards the camera is a man. As we turn the corner we have a lady in a crinoline dress but without the hoop and a gentleman sitting next to her. It must be raining for he is holding up an umbrella. Just passing them heading for the entrance of the hotel is a one-legged man with a crutch, while at the entrance to the hotel is a man with a pony and trap, probably waiting on customers.Over to the left sitting on a cast iron seat and wrapped up well are two ladies enjoying the fresh sea air. 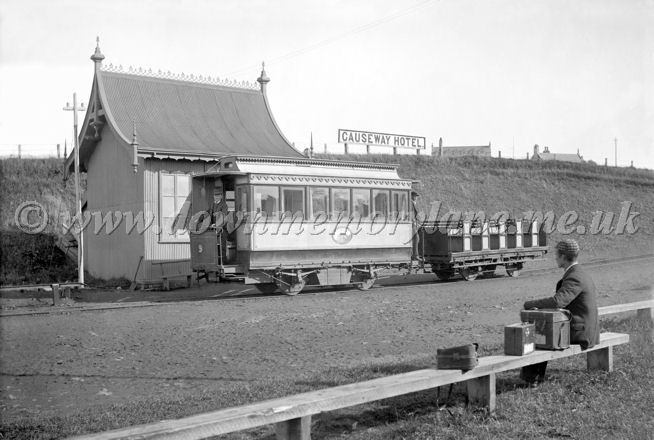 This is the Causeway Electric train at the Causeway Hotel which was the end of the line, the train used to run from the train's terminus in Eglinton Street next to the Portrush Railway Station. The first section of the tramway, from Portrush to Bushmills, was opened on 29 January 1883, some of the timetabled passenger traffic was handled by steam tram engines which were in any case necessary on the town section in Portrush where it was impossible to provide electric power since this was originally fed to the trains via an elevated third rail which ran alongside the line. The ceremonial opening, using electric traction, took place on 28 September 1883 although a full scheduled electric service did not begin until 5 November and steam locomotives remained available for use until at least 1926. The section from Bushmills to the Giant's Causeway opened on 1 July 1887. In 1895 a cyclist died of electric shock after coming into contact with the conductor rail. At the subsequent enquiry it was revealed that the line voltage varied from an average of 290 V up to 360 V, and the company agreed to a temporary reduction in the voltage, which limited the number of services that could be electrically worked. The third rail was replaced by overhead electric wire using side poles from 26 July 1899, apparently initially at 250 V.Voltage drop remained a problem and the tram was the subject of a song by the Irish Rovers which comments on its slow speed. After upgrading of the Bushmills generating station in 1907 it was possible to produce a 550 V output. This photograph has been posed for the photographer so that the people in are not blurred due to the long exposure. Sat on the bench is most likely the photographer's assistant with his arm leaning on a carrying case next to a spare camera, this lets you see the size of the camera, imagine carrying that around all day.